Requirements: Atari 520ST system with a color monitor. Joystick optional. 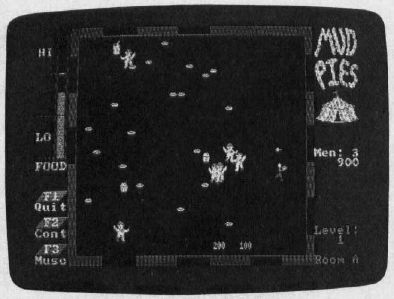 Mudpies is the first arcade-style game we've seen for the Atari 520ST. It turns you into Arnold, a fairly nasty kid who likes to disrupt the circus by throwing pies at clowns. Not that he's without provocation, for the clowns crowd him at every opportunity, sending him to the First Aid tent at the slightest touch. And the clowns throw things back at Arnold—those Indian clubs used by jugglers. Get beaned with one of those, and you guessed it—another trip to the First Aid tent. Three trips to First Aid and the game's over (although you can withstand additional trips for each 10,000 points scored). Reminiscent of Robotron, Mudpies is a fast-action, grip-the-joystick (or mouse) kind of game. Six rooms in each level are littered with mudpies you can pick up and fling in the direction you're moving. The clowns, like robots really, swarm toward you. They're not very bright, and they can be avoided with a little fancy footwork. But there are enough of them, with more waiting in the wings, to make it interesting. Also, they bear more than a passing resemblance to Ronald McDonald. Arnold has other things on his mind besides clowns, however. His energy level depends on the fast food he finds, and if he doesn't eat enough hamburgers, fries, and shakes, he'll slow down terribly. Eat too much, though, and the people watching you play will shout "You're getting fat!" Overeating slows down Arnold, too. One or two people can play Mudpies, with two players alternating turns. The graphics are entertaining, as is the music (up to a point, when you might prefer to turn it off with a press of a function key). Looking like an IBM PC game more than anything else, down to the typeface of the display, Mudpies doesn't take full advantage of the ST. No menus, no icons, and you can't return to the GEM desktop without rebooting—but the game is still a tent full of fun. Pesky clowns swarm toward Arnold as he defends himself by flinging mudpies. The only way to score points is to splatter clowns. Advancing to the next room or level changes neither the scoring nor the speed or intelligence of the clowns. It makes for a repetitive game, and you can get good at it in a short time. One interesting feature is something called the Mudslinging Round, where the clowns don't chase you and don't throw things. You've got 30 seconds to mudpie as many of the purple-wigged clowns as you can, racking up bonus points left and right. It's great revenge. Though you can control Arnold with the mouse, try a joystick instead. Mouse controllers may be great for manipulating Macintosh-style graphics, but for anyone who's arcade-trained, a joystick will probably feel more natural. In a fast game like Mudpies, you need every edge you can get. If you rack up one of the highest scores, you can type your name on a vanity screen. However, the screen is not saved on disk. Unfortunate, for the game is addicting enough to make you want to beat whatever score was last posted. Function keys let you pause the game and turn off the music (though not the sound effects). A few bugs cropped up while playing Mudpies. Several times the game paused on its own, the music suddenly turned itself on, and once the game stopped altogether and flipped back to the title screen. MichTech attributes all these bugs to the 520ST's operating system, saying that erratic control codes are being read from the joystick. The bugs are irritating, but not disastrous. Keep an eye on this computer—its wide selection of colors, large memory, and speed make it a potentially great game machine. Mudpies, first out of the blocks, is a good beginning.